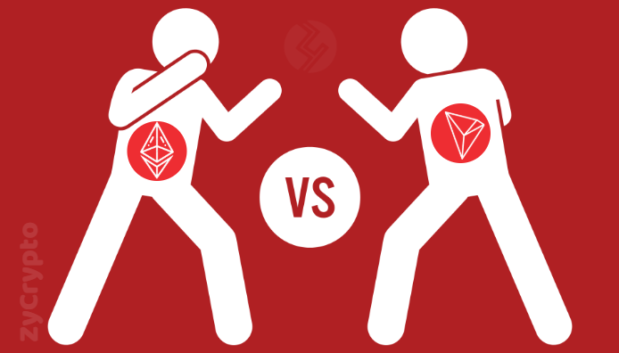 What’s are the main differences between ETH and TRX at the moment? From the beginning of 2019 Ethereum network didn’t succeed to get it’s job done. They have prolonged their transition to POS for minimum one (or two) years. They have postponed Constantinople hard fork several times and the last was at January 16, when a firm detected a security issue with this upgrade. All these things make Ethereum network more unreliable, clients want solidity, fast reactions in finding problem solutions. On the other side, Tron have made a large step at the end of the 2018 by attracting a lot of dApps developers to Tron network with large fund for help that transition. And, it’s paid off a lot. The other thing that Tron has is a large media coverage and very good marketing team around the company, Every new thing implemented to TRX, every conference, every reached milestone in their whitepaper is promoted and well covered by news portals and whole crypto world getting those information at the same day of publishing. So, what would be secret weapon for Ethereum? Well, there is no a lot of secrets about it. Ethereum was very “conservative” from its’ beginning. Almost zero marketing was involved, most of decisions were made “between four walls” and it looks that it is a time to switch that strategy. Ethereum has a more potential energy stored and they have to show that to everyone, to publicise it more often. ETH is too quiet (maybe sleeping giant waiting for it’s moment?) and needs to be more transparent. ETH community is one of the largest in crypto world, but it looks that it is not involved enough. If Vitalik turn the other page and make steps to get closer to community, I am 100% sure that it will react very positive and that would be a giant leap to better future of Ethereum.